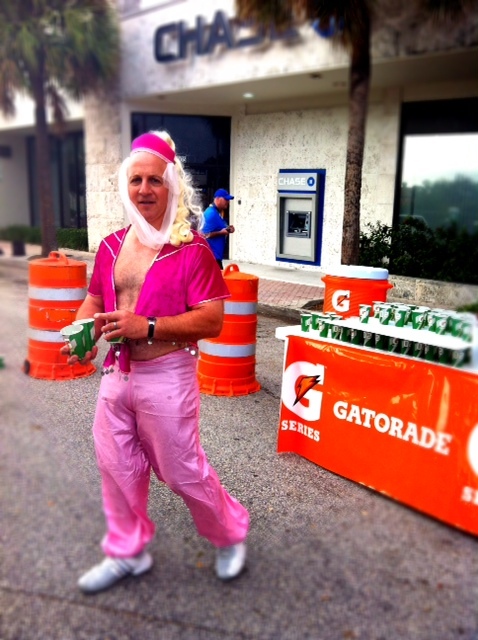 Yesterday I got my spectatin’ on at the Space Coast Marathon in Cocoa, FL. The day started early with a 3:15 am wake-up and a 4 am meet-up time with friends that were running the race. We got to Cocoa in less than 45 minutes so that gave my friends plenty of time to warm up and get to the start line by 6:15 am. The start of the race was signaled by a big screen rocket launch and a simple “Go!” on the speakers. I overheard a couple of racers complaining that there was no gun or bull horn to start the race. Personally, I’m never at the front of a race start line so I don’t care either way. 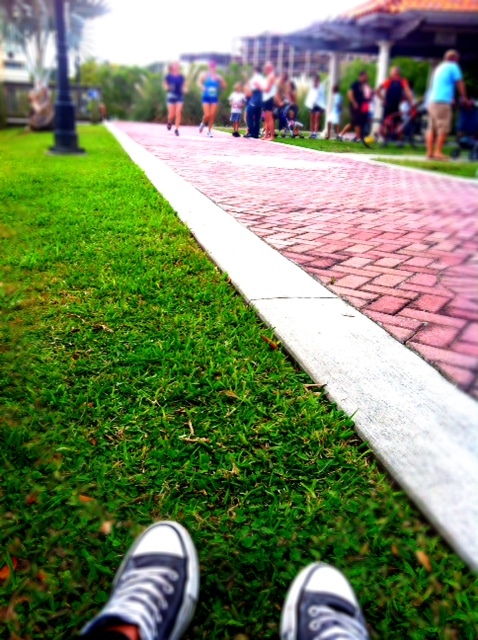 I go when the people in the corral in front of me go. Or someone pushes me forward. 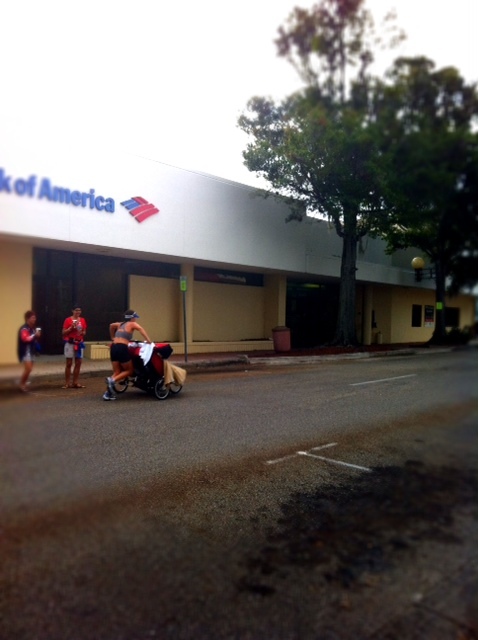 I watched the runners take off then ran over to King Street to catch my friends again when the looped around. By then it had started to lightly drizzle so I walked back to the car for an hour of rest before I headed back out to the finish line to catch the half marathon winners. I got there just in time which was awesome because fast runners are so fun to watch. Can you believe that she ran the entire marathon with that stroller? There were three kids in that bad boy and I think I saw her come in under 5:00! 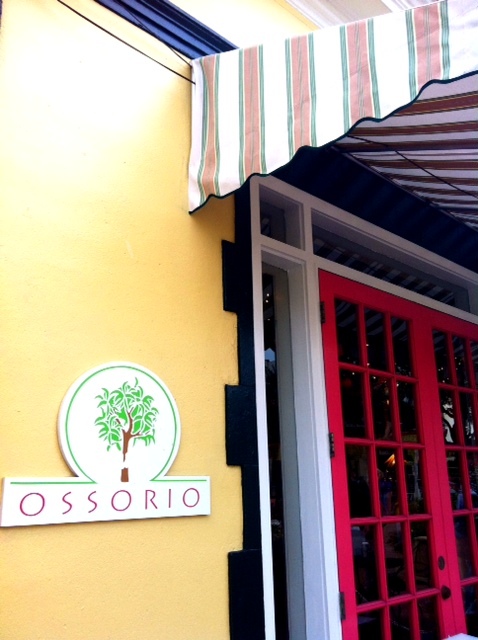 Shortly after, I hit the jackpot when I stumbled across Ossorio, a cafe and bakery with tables outside. 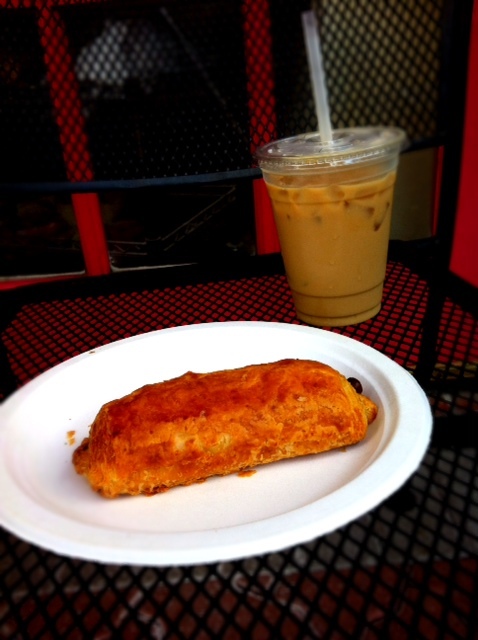 I ordered some iced coffee and decided I deserved a chocolate croissant for waking up so early. I sat here until I saw the 5:00 pace group run by then moved up the street a little. 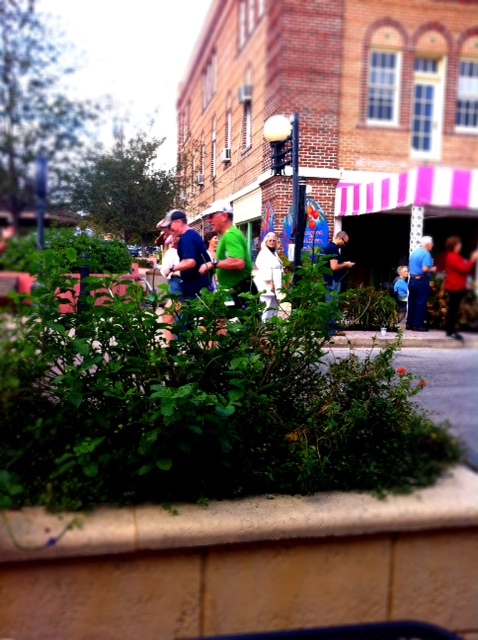 While I waited for my friends in my new spot I caught a few fellow Marathonfesters as they ran by. I was standing somewhere around the half marathon marker and loved that I saw so many people still smiling. I walked a little over a mile with my friends then dipped out to get out of the sun. By this point the clouds had cleared and the sun was beating down. This did not fare well with my black jeans. I walked back towards the finish line and stopped to watch some dolphins that were feeding in the inter-coastal. I love me some dolphins! Time flew as I sat and watched runner after runner round that corner and realize they were almost finished running 26.2 miles. I saw them suddenly shed that weight of months of training and hard work and pick up their heavy legs. I saw them cry in pain, or relief, or joy, or a combination of those all. I saw kids running that last .2 miles with their parents, looking proud and excited. I saw complete strangers encouraging runners to “Keep it up” and “Finish strong.” I saw hard work, determination and accomplishment cross in front of me in all shapes and sizes and ages. I saw badass in men and women 2.5 times my age. I saw amazing. If you’ve never stood at the finish of a marathon, I strongly recommend it. It’s one of the most emotional and incredible things to get to witness. Make sure to bring a tissue, because you’ll more than likely cry at least once. Five of the runners I knew said this was their worst marathon performance ever. Two of them said every year it’s their worst marathon performance. I would consider running the half marathon course, but you won’t find me running any full in November in Florida two days after Thanksgiving. Have you ever run the Space Coast Marathon or half? If so, how did you like it?